Okay, so the Garlic and Onion blog a few days back evoked a good deal of interest. So what about Onions and Garlic in Indian cooking? Like South Indian Cuisine for instance. Here’s some comments I received some time back on the subject. “Dear Kurma, I would like to share a sambar recipe slightly different from Swathi’s. I am also from South India (Bangalore) and I belong to Smartha Brahmin (Worshipers of Shiva) community. I hope you like this recipe. To make sambar for 2 people: 1/2 cup toor dal (pressure cooked) + use any vegetables (eggplant, radish, drumsticks, spinach, potato etc). Boil the vegetables with the dal – this gives a different taste to the sambar. Add 1 tsp tamarind paste. Salt to taste. To make the sambar masala: 1/2 tsp coriander seeds, 1 cinnamon stick, 1 tsp channa dal, 4-6 red chillies, 1/4 cup fresh grated coconut. 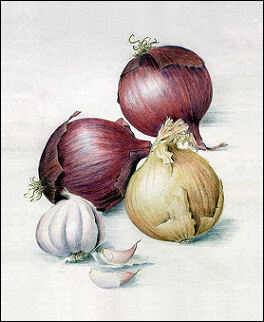 “The use of onions and garlic in south Indian cuisine is not culturally inherent. I have studied an old cookbook written by a Smartha Brahmin mataji named Smt Meenakshi Ammal. She published her first cookbook Samaithu Par (Cook and See) in 1951 when books of such categories were not favoured by publishers then. There are 350 traditional vegetarian recipes in the book (she went on to publish another 2 under the same title). Barely even 5% of the recipes include onions and garlic. In fact, in recipes where these items are called for she added the word “optional” in brackets next to these two ingredients. So its obvious from this that traditionally orthodox south Indian cooking eschewed onions and garlic. Another evidence is during the shraddha ceremony, when charity is given to the brahmin priest who performs the rituals. Apart from a dhoti and cash he is given in charity a complete set of raw uncooked food items such as vegetables, spices, oil, milk, yogurt etc. Onions and garlic are omitted. Any more comments on garlic and onion use in the Subcontinent?